Using the eddy covariance and biometrical methods, the carbon balance was measured in a deciduous broadleaf forest in Japan, where incidental damage by a strong typhoon damaged 40% of trees. Before the disturbance, the forest was an evident carbon sink, and it subsequently transformed into a net carbon source. GPP only decreased by 6% just after the disturbance. On the other hand, Re increased by 39%. Undergrowth dwarf bamboo has an important role in the carbon balance. Natural wetlands in China have experienced extensive conversion and climate warming, which makes the estimation of methane emission from wetlands highly uncertain. 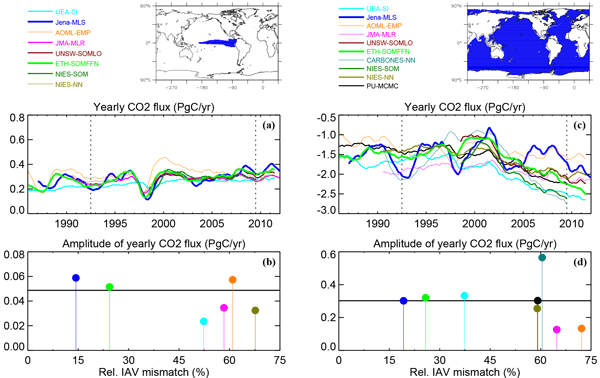 In this paper, we simulated an increase of 25.5% in national CH4 fluxes from 1950 to 2010, which was mainly induced by climate warming. Although climate warming has accelerated CH4 fluxes, the total amount of national CH4 emissions decreased by approximately 2.35 Tg (1.91－2.81 Tg), due to a large wetland loss of 17.0 million ha. We calculate the carbonate saturation state of surface water from the Ross Sea and along a transect between the Ross Sea and southern Chile using ~ 1700 total alkalinity measurements. Our results suggest that variability in surface carbonate saturation state is driven by biological productivity. We argue that in the Ross Sea the aragonite saturation state of surface water during the early spring never falls below 1.2. Why is Trichodesmium abundant in the Kuroshio? The high abundance of Trichodesmium and active nitrogen fixation in the Kuroshio were not explained by the nutrient (nitrate, phosphate, and iron) distribution. We observed a Trichodesmium bloom and high nitrogen fixation near islands situated along the Kuroshio. Numerical particle-tracking experiments simulated the transportation of water around the Ryukyu Islands to the Kuroshio. Our results indicate that Trichodesmium growing around the Ryukyu Islands could be advected into the Kuroshio. 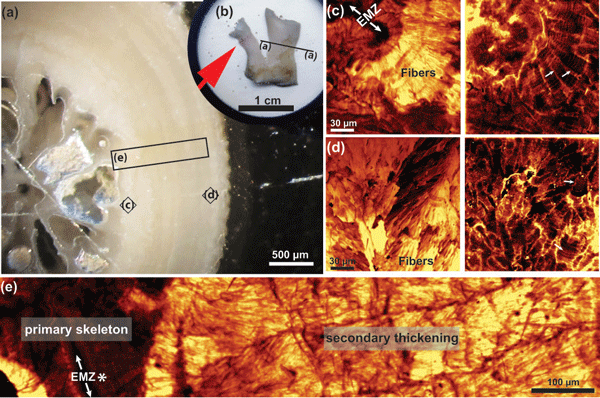 We measured the oxygen isotopic composition of Late Jurassic chondrichthyan teeth (sharks, rays, chimaeras) from the Swiss Jura to get ecological information. The main finding is that the extinct shark Asteracanthus (Hybodontiformes) could inhabit reduced salinity areas, although previous studies on other European localities always resulted in a clear marine isotopic signal for this genus. We propose a mainly marine ecology coupled with excursions into areas of lower salinity in our study site. We analyze changes in marine net primary production (NPP) and its drivers for the 21st century in 9 marine ecosystem models under the RCP8.5 scenario. NPP decreases in 5 models and increases in 1 model; 3 models show no significant trend. The main drivers include stronger nutrient limitation, but in many models warming-induced increases in phytoplankton growth outbalance the nutrient effect. Temperature-driven increases in grazing and other loss processes cause a net decrease in biomass and NPP. We found that changes in wintertime and springtime precipitation played a more important role in the interannual variability of mean vegetation greenness while climate warming was mainly responsible for the 30-year positive trend in the magnitudes of mean vegetation greenness in the dryland ecosystems in the US Great Basin during 1982–2011. In this study, we showed that logging activities have a short-term impact (1 year after the perturbation) on water quality in boreal Eastern Canadian Shield lakes. However, this effect seems to mitigate 2 years after the perturbation. Further, the analysis of the absorbance and fluorescence data showed that while DOC concentrations did significantly increase in perturbed lakes, the DOM quality did not measurably change. Flux chambers represent a potentially powerful methodological approach for measuring greenhouse gas emissions from running waters. Here we compare the use of anchored and freely drifting chambers on various streams and provide novel guidance on how to apply flux chambers in these systems. The study clearly shows that drifting chambers have a very small impact on the water turbulence under the chamber, while anchored chambers enhance turbulence under the chambers and thus elevate fluxes. Dissolved organic carbon (DOC) has already been identified as a potentially significant source of carbon export in the Mediterranean Sea, though in situ export estimations are scarce. This work provides a thorough analysis at basin scale of carbon export with the coupled model NEMO-MED12/Eco3M-MED model. The seasonality and the processes of particulate and dissolved carbon production are also investigated. DOC export appears to be dominant in most regions, especially in the eastern basin. Soil pH buffering capacity plays a crucial role in predicting acidification rates, yet its large-scale patterns and controls are poorly understood, especially for neutral-alkaline soils. Here, we evaluated the spatial patterns and drivers of pHBC along a massive 3600km transect of land in China, stretching from the country’s subarctic north to its arid deserts. We found distinct drivers of soil acidification processes in different types of soil across northern China, resulting in a new advance. At the eastern border of the West Siberian Plain, south of permafrost, peat started to accumulate 15000 years ago. Peat accumulated as fen peat at a constant rate of 0.2 mm yr-1 and 0.01 kgC m-2 yr-1. Over the last 2000 years, the bogs have changed into Sphagnum mires, accumulating about 0.1 kgC m-2 yr-1 until the present. The high accumulation rate of peat in unfrozen mires indicates that thawing of permafrost peat may change northern peatlands into long-lasting carbon sinks. Our manuscript represents the first field-based data set on the abundances of hydroxy fatty acids (FAs) in fresh snow and its filtering capacity to reduce hydroxy FA burden on the atmosphere. •Hydroxy fatty acids (FAs) in snow indicate a contribution from soil microbes and higher plants. •Air mass back trajectories reveal their transport from Russia, Siberia and China. We conducted the present study to better understand the impact of aeolian transport on bacteria & their filtering by snow. We report on the oxygen isotope signatures in green sea turtle (Chelonia mydas) barnacles (Platylepas sp.) to suggest likely regional movement patterns by mapping these onto a predictive oxygen isotope map of the Pacific. Exploring barnacle proxies potential relevance as an alternative tool with which to study green sea turtle migration, we find that these could complement traditional methods of studying connectivity between turtle populations and help inform more effective conservation policy. Leaching experiments were carried out on fresh ash samples from the 2012 Popocatépetl, and 2011/12 Etna eruptions, in order to investigate the release of compounds in water. Results were discussed in the light of changing pH and release of compounds for the different leachates. They were used for toxicity experiments on living biota (Xenopus laevis). They are mildly toxic, and no significant differences exist between the toxic profiles of the two leachates. We elucidated ocean dynamic processes causing spatially-heterogeneous sedimentary radiocaesium-137 distribution in and around the shelf off Fukushima and adjacent prefectures on the basis of numerical simulation. Our result suggests that accumulation of sedimentary radiocaesium-137 in a swath just offshore of shelf break results from spatiotemporal variation of bottom friction occurred via a periodic spring tide about every 2 weeks and via occasional strong wind. Microorganisms have been recognized as an important source of soil organic matter (SOM). Autotrophic microorganisms utilize CO2 instead of organic carbon. Microbial CO2 fixation is accompanied with high 13C isotope discrimination. Because autotrophs are abundant in soils, they might be a significant factor influencing 13C signatures of SOM. Thus, it is important to asses the importance of autotrophs for C isotope signatures in soils, in order to use isotopes as a tracer for soil C dynamics. Previous model evaluation studies have shown that terrestrial biosphere models (TBMs) need a better representation of the leaf phenology, but the model deficiency could be related to incorrect model parameters or inaccurate model structure. This paper presents a framework for optimising the parameters of phenology models that are commonly used in TBMs. It further demonstrates that the optimisation can result in changes to trends in vegetation productivity and an improvement in gross C fluxes. Based on our molecular data and performed analyses we found that the gastropods studied represent a comparatively old group that most likely evolved with a constant rate of diversification. However, preliminary data of the SCOPSCO deep-drilling program indicate signatures of environmental/climatic perturbations in Lake Ohrid. We therefore propose that the constant rate observed has been caused by a potential lack of catastrophic environmental events and/or a high ecosystem resilience. 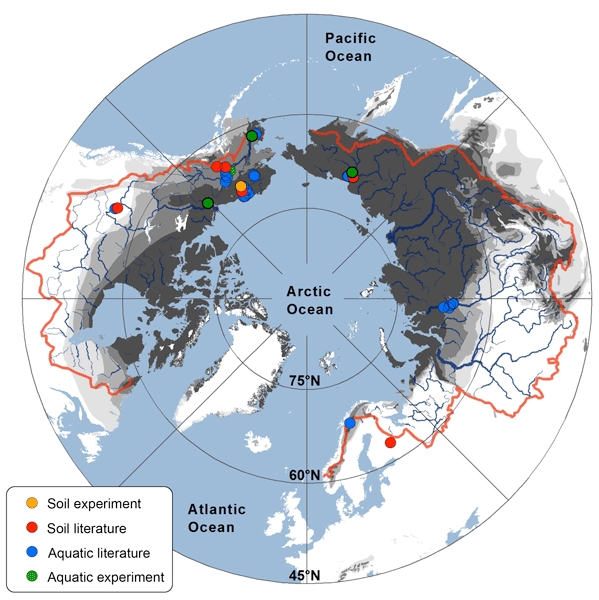 Global warming thaws permafrost and accelerates the formation of thaw ponds in subarctic and arctic regions. 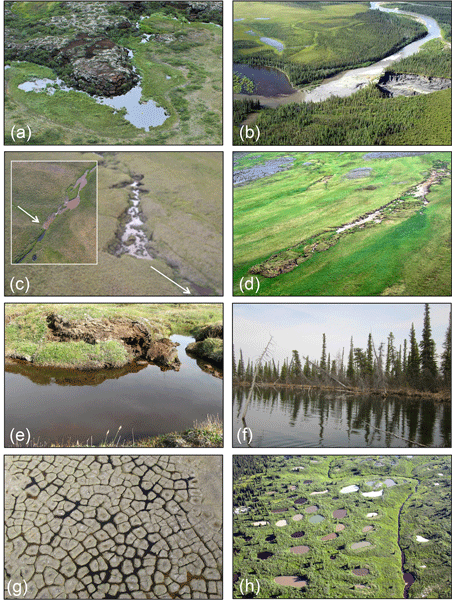 These abundant ponds receive large terrestrial carbon inputs from the thawing and eroding permafrost, which is mainly used by bacterioplankton for the production of new biomass. Bacteria metabolism also produces high levels of CO2 and CH4, which make thaw ponds important sources of greenhouse gases to the atmosphere. We present carbon dynamics in thaw ponds in northern Quebec. We summarized all available data on N-oxides and land use change, which could improve current IPCC tier 1 and 2 approaches for tropical countries. The meta-analysis showed that conversion to (non) fertilized agriculture had the largest effect. Further, we synthesize that the first years after conversion and land management practices are crucial for correctly accounting N2O and NO fluxes. Knowledge gaps remain for degraded forests, peat forests and dominant world crops such as oil palm and soy. Using a temperature-salinity-based extrapolation of in situ surface-fCO2, in conjunction with SMOS SSS and OSTIA SST, fCO2 is mapped within the eastern tropical Pacific Ocean (ETPO) at high spatial (0.25°) and temporal (monthly) resolution. Strong interannual and spatial variability is identified, with net outgassing of CO2 in the gulfs of Tehuantepec and Papagayo contrasting net ingassing in the Gulf of Panama. For the period of July 2010-July 2014, the ETPO was supersaturated by ~40μatm. There has been increased salinization of fresh water over decades during the urban evolution of watersheds. This study finds that salinization consistently increased sediment releases of labile organic carbon and total dissolved Kjeldahl nitrogen and sediment transformations of nitrate, and the salinization effects increased with percentage watershed urbanization. These findings are will be critical for forecasting changes in carbon and nutrient exports due to salt use in urban watersheds. The effect of warm-season precipitation on environmental conditions and ecosystem-scale fluxes at a high-elevation subalpine forest site was investigated. As would be expected (based on the surface energy balance), precipitation caused an increase in latent heat flux (evapotranspiration) and a decrease in sensible heat flux. The evaporative component of evapotranspiration was, on average, estimated to be around 6% in dry conditions and between 15-25% in partially wet conditions.